“He does not want to be God’s servant”-Satan was a cherub and his position was to guard the very throne of God. His position was that of protecting the holiness of God. Satan had the highest of all positions, a position which he despised and lost. We have here in Ezekiel a picture of the highest of God’s creatures, perfect in wisdom, beautiful beyond description, a musician and on top of all that, he was given this high, exalted position. What kind of iniquity was found of him? In the book of Ezekiel, God has let us stand with Him at the very beginning, to see the origin and the creation of Satan. But, why does God say this? What is this iniquity? That is Lucifer/Satan’s sin and that is the iniquity that was found in him. He does not want to be God’s servant. He does not want to do what he was created to do. He wants to be served and there are millions who have chosen to do just that; serve him. They have listened to his lies and chosen to follow him. Eve believed the lie that she would be like God. The reason Lucifer/Satan tempted her with that was because it is the very thing that he wants — to be God. 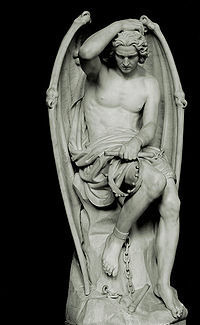 Lucifer is a fallen angel who was the head of the ministry of music in Heaven when he was in heaven. It has been said of him he was the most beautiful of ALL angels and he was the director of the flow of music there (Praise and Worship). 1 Then I saw an angel come down from heaven with the key to the bottomless pit and a heavy chain in his hand. 2 He seized the dragon–that old serpent, the Devil, Satan–and bound him in chains for a thousand years. 3 The angel threw him into the bottomless pit, which he then shut and locked so Satan could not deceive the nations anymore until the thousand years were finished. Afterward he would be released again for a little while. 4 Then I saw thrones, and the people sitting on them had been given the authority to judge. And I saw the souls of those who had been beheaded for their testimony about Jesus, for proclaiming the word of God. And I saw the souls of those who had not worshiped the beast or his statue, nor accepted his mark on their forehead or their hands. They came to life again, and they reigned with Christ for a thousand years. 6 Blessed and holy are those who share in the first resurrection. For them the second death holds no power, but they will be priests of God and of Christ and will reign with him a thousand years. 7 When the thousand years end, Satan will be let out of his prison. 8 He will go out to deceive the nations from every corner of the earth, which are called Gog and Magog. He will gather them together for battle–a mighty host, as numberless as sand along the shore. 9 And I saw them as they went up on the broad plain of the earth and surrounded God’s people and the beloved city. But fire from heaven came down on the attacking armies and consumed them. 10 Then the Devil, who betrayed them, was thrown into the lake of fire that burns with sulfur, joining the beast and the false prophet. There they will be tormented day and night forever and ever. 11 And I saw a great white throne, and I saw the one who was sitting on it. The earth and sky fled from his presence, but they found no place to hide. 12 I saw the dead, both great and small, standing before God’s throne. And the books were opened, including the Book of Life. And the dead were judged according to the things written in the books, according to what they had done. 13 The sea gave up the dead in it, and death and the grave* gave up the dead in them. They were all judged according to their deeds. 14 And death and the grave were thrown into the lake of fire. This is the second death–the lake of fire. 15 And anyone whose name was not found recorded in the Book of Life was thrown into the lake of fire.